Over the next 30 years, Irving Shipbuilding’s team of world class shipbuilders will construct up to 21 modern naval vessels and continue our legacy as Canada’s shipbuilding and in-service support centre of excellence. While our team consists of individuals with decades of shipbuilding knowledge and expertise, we are also committed to attracting and retaining recent graduates and young professionals. 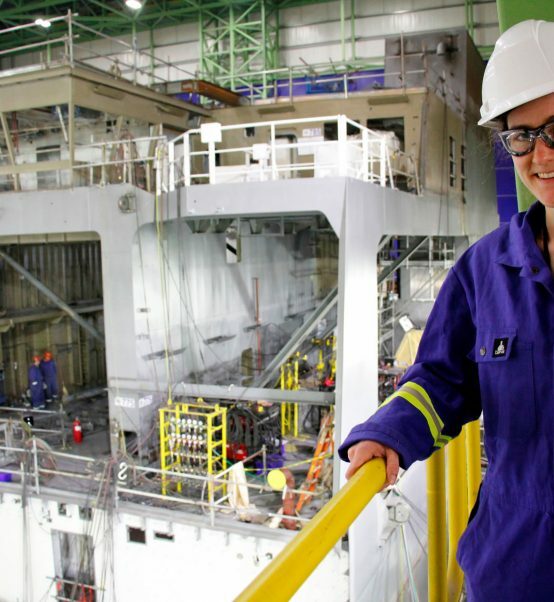 In 2016 we launched the Irving Shipbuilding Young Professionals Network (YPN) to engage young professionals less than 30 years of age as they begin their careers in shipbuilding. YPN ensures they have professional development and networking opportunities to help shape their career ambitions and bring out the best in each of them. “The YPN provides an opportunity for young professionals to interact, engage and learn from each other and senior members of our team, including our President and Vice Presidents, on topics of importance to the business ranging from interpersonal skills and teamwork to productivity and finance,” said Nicole MacNeil, Human Resource Business Partner and Chair of the Young Professionals Network. Irving Shipbuilding's Young Professionals Network from Irving Shipbuilding on Vimeo. A YPN committee of employees from across the organization work with an executive sponsor to identify and launch professional development and mentorship opportunities to help young professionals grow their skillset and increase their knowledge of the business. “For me the interesting thing when I looked at the number of people in the YPN was the number of leads and managers we already have who are under 30. It is really encouraging to other members of the YPN to say, ‘Okay there is a future here for me. There are lots of opportunities in this organization and in the wider J.D. Irving, Limited network’,” said Nick Wright, Vice President Supply Chain and YPN Executive Sponsor. To date, the YPN has held professional development sessions on personal branding, learning styles, teambuilding, and networking 101. Irving Shipbuilding President Kevin McCoy and Vice Presidents from across the organization have also lead sessions to share their knowledge and lessons learned throughout their careers with this group of future leaders.